Andrea Rosado, a fourth-year medical student at the University of Cincinnati (UC) College of Medicine, has interviewed with 15 residency programs, meeting with physicians in the Midwest, East Coast, as well as Denver and Portland, Oregon. The fourth-year medical student hopes to practice family medicine someday. Rosado, along with graduating medical students across the country, will learn Friday, March 15, during the annual Match Day where they will spend the next three to seven years of their lives in residency training. At UC, medical students will gather for festivities around 11:45 a.m. in Kresge Auditorium in the Medical Sciences Building (MSB), while any overflow crowd of parents, friends and supporters will watch via satellite video in nearby Room E-351. The names of students are called lottery-style during Match Day, and they come to the front of the room to open their residency envelopes, explains Zachary Crawford, a fourth-year medical student and co-class president helping to organize Match Day festivities. The atmosphere is celebratory and marked with special T-shirts for the class, “walk-up songs” for each student, along with cheers, tears, hugs and selfies. Students also pin their residency location on a large U.S. map. The festivities cap off a week of celebrations for Match Day at UC, says Crawford. After a months-long residency interview process, the National Resident Matching Program (NRMP) does the actual matching, linking the program preferences of students with those of residency program directors. 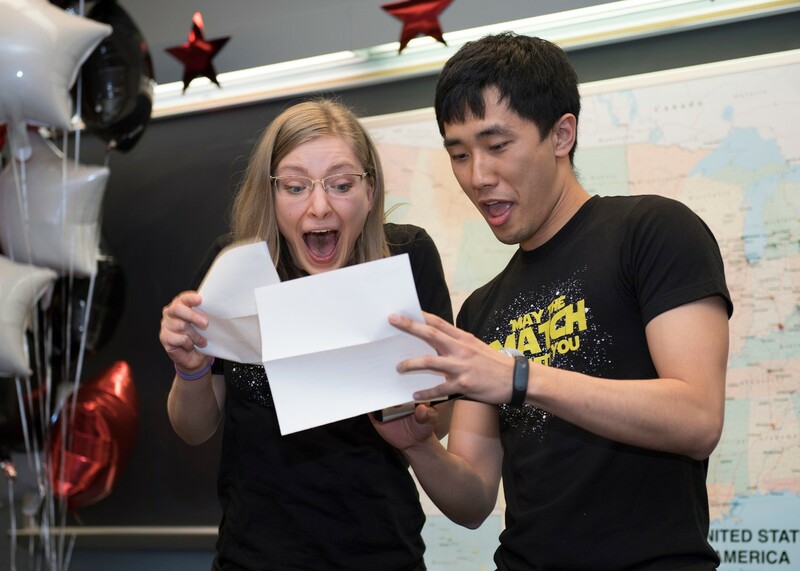 Two medical students enjoy festivities at UC College of Medicine's 2018 Match Day. Rosado and Crawford say their respective families will be watching the big day’s activities. Crawford says his family will be at UC while Rosado, whose family resides on Long Island in New York, will watch via live streaming. “It is a very exciting time and I will be looking forward to knowing where I will be spending the next four to five years of my life hopefully matching into orthopedic surgery,” says Crawford. “At the same time there is a little bit of nerves. Everyone puts in their rank list and some people have 10 places ranked and some people have 20. “I think everyone is excited, but also nervous to find out where we will be going. This year, Filak will pull the first envelope for the class, with Aurora Bennett, MD, associate dean of student affairs, and Bruce Giffin, PhD, associate dean for medical education, pulling the rest of the envelopes. “Match Day is the culmination of the many hours that students dedicate to studying, patient care, research and community service in preparation for transitioning to specialized training in their chosen field of medicine,” explains Bennett. “According to the NRMP, approximately 84 percent of medical students will match to one of their top four programs in the nation. UC Academic Health Center will post Match Day photos via Twitter @UCHealthNews using the hashtag #CincyMatch2019. Also, follow the College of Medicine Office of Admissions Instagram account for Match Day coverage at @Cincinnati_Medicine. Spectators can also follow the event on Snapchat. Visit https://www.snapchat.com/add/uofcincy to add the main UC account and receive snaps/view stories on Match Day.